200 Acre Ranch Wildlife exempt Residential/recreational Hunting Heaven! Exquisite 4000 sqft hill-top custom home with panoramic views! Superior craftsmanship with opulent amenities, gourmet kitchen, top of the line Kitchen Aid appliances, granite & custom woodwork throughout the home. Spectacular vaulted in living & dining, curved granite bar, full windows, fireplace, stained concrete floors. Prominent master, outside access, arched ceilings with accent lighting, luxurious bath & closet. Loft with balcony as 3rd bedroom, game or studio, 2 bath. 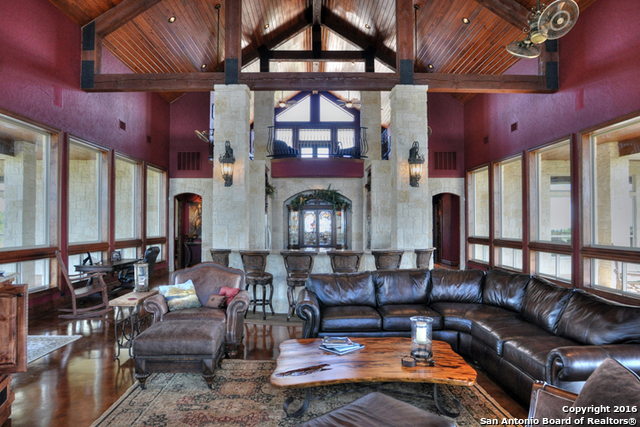 4000 sqft of covered walk-around porch, covered outdoor kitchen, bar, dining & fire-ring. 2 Car Carport with storage. Water Storage tank, elec gate entry. Whitetail deer, Axis, hog & birds are abundant in this area of the Hill Country. Great WILDLIFE habitat! Bring your horses, 4-wheelers family & friends and discover the Hill Country!